As winter rains begin to fade into spring showers and sun filled evenings, we welcome a new season. It is time to assess the market, evaluate our position and prepare for the future. No doubt, the last few years have been good in wine country with increasing wine grape and real estate prices. While things are still good in wine country, there have been some changes in the market over the last six months. In a broad sense, we have seen the real estate market shift down a gear, primarily due to higher interest rates and buyers’ unwillingness to accept continued price increases. In addition a large 2018 harvest created a surplus of wine grapes. Wineries are finding sales flat. Most expect this to lead to lower grape and bulk wine prices, longer lag time for wineries to commit to contracts and potentially some wineries looking to cancel contracts. Last but not least, the 2017 and 2018 wildfires presented further challenges. These variables point to a more restrained market going forward. Buyers and sellers will need to readjust their expectations. In other words, after many years of growth and a seller’s market we are looking at a more normalized scenario where buyers and sellers have equal footing. 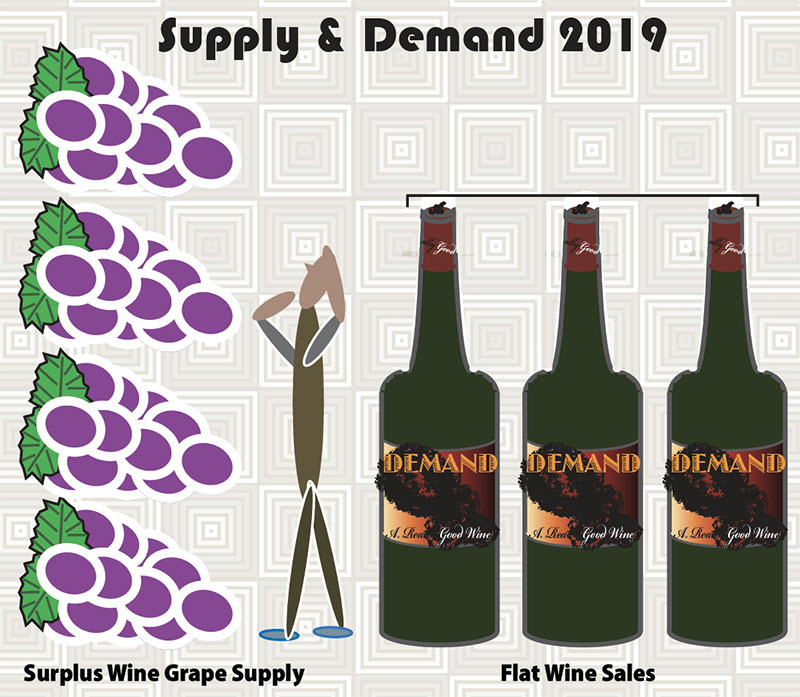 On the wine grape sales front, wineries will tend to have more leverage. We have moved from a definitive Seller’s Market towards a “normalized” scenario where buyer and seller have more equal footing. It is not all doom and gloom; we have been here before. We will work through the grape surplus cycle. Napa and Sonoma are world-class wine grape growing regions and quality still commands a premium. Wine country is an amazing place to live and our proximity to the Bay Area provides a steady flow of well-heeled buyers and consumers. That said, in this type of environment everyone is looking for a competitive advantage and how to set themselves apart from the crowd. For vineyard owners one way to differentiate is the way you farm. In today’s world going green has never been more popular. Whether that means sustainable, organic or biodynamic, these applications are more prominent than ever. Naturally, there is debate about what these terms actually mean, but we can all agree that moving toward a more sustainable process is in everyone’s interest. With that in mind, let’s take a look at general principles for each designation. For a lack of a better term, “traditional” farming involves mass farming practices which began in the 1930’s with mechanization and synthetic material becoming more available. This approach created more efficiency, simplification and low cost for high production. However, the use of synthetic chemicals, fertilizers, genetically modified inputs, high energy demands, and a lack of care for ecology has had a negative impact on the soil and environment. This may be one of the most debated terms in farming but certainly a step in the right direction. Sustainable farming started in the 1950’s – 1960’s. The term sustainable doesn’t just relate to the environment but crucial economic sustainability. Sustainable farming takes a more holistic approach incorporating bio diversity, supporting the environment, wildlife habitat and soil quality, using responsible water management and energy conservation. The focal points of sustainable farming are environmental health, economic profitability and social equity. In encouraging news, 89% of Sonoma County Winegrowers Association members have been verified as sustainable. In Napa County 55% of vineyard acreage has been certified by the Napa Green sustainability program. Check out CSWA (Certified California Sustainable Winegrowing Alliance) for more information. Organic farming started in the early 1900’s in response to “traditional” farming. Generally speaking, the idea is to be more “natural” and minimize modified inputs. In order to be certified the land has to go three years without any prohibited substances. Soil fertility is maintained by crop rotation, cover crops and supplemented with compost containing animal and crop waste. Weeds are controlled through manual labor and there is no use of genetically engineered material. Organic farming tends to be more expensive than sustainable practices. Check out CCOF (California Certified Organic Farmers) for more information. Beyond organic. Biodynamic farming was introduced in the 1920’s by Rudolph Steiner with an all-encompassing approach that incorporates both earthly and cosmic inputs between the material and spiritual world connected through philosophy. According to Steiner, the entire universe impacts the results on the ground. Each farm is an organism and must be as self-sufficient as possible with both crops and livestock, using byproducts as part of the self-sustaining process. Because synthetic materials are not living and do not come from the living, they cannot be used in biodynamic farming. It is important to note that there are many vineyards that would fall into any one of these categories but are not officially certified. The cost, the process and sometimes the lack of consensus on certification has pushed some to follow their own path. More significantly, the majority recognize that farming in an ecologically responsible manner is crucial for the health of our environment, industry and community. The good news is that our region and industry are making the right moves to protect our long-term interests. Near-term we are looking at choppy waters, but we will work through it. At least in my mind, we still live in one of the most desirable regions in the world. Based on the continuous inquiries I receive from buyers around the world, they would agree. If you have questions about the marketability and market value of your property, please feel free to give me a call or send an email. Otherwise, get ready to enjoy another vibrant and beautiful spring season in wine country.